This new Father's Day gift basket for dad is sure to be a hit. 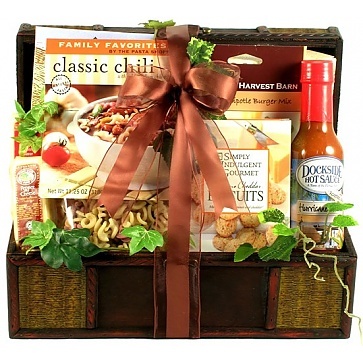 It features a handsome wooden trunk filled with a delicious selection of sauces, mixes, a chili kit, cheeses and more! We just know dad is going to love our "Father's Day Favorites" gift basket. It starts with a handsome wooden trunk and gets filled with classic flavors that dads love. Men love food gifts and this one was put together with dad in mind - this Father's Day gift basket full of dad's favorites is sure to be appreciated and enjoyed.